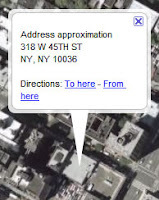 If you are a Google Earth Pro user, you can quickly obtain the approximate address for many locations. In the geeky GIS world, we call this "reverse geocoding". This means that you visually pick location and Google Earth Pro provides you its best guess for an address for this place. Give it a try. Just navigate to the appropriate place, press down the Ctrl key and right click (Ctrl + click on the Mac) a location. This only seems to work in the USA. It doesn't work in Australia or France. Globeglider has been around for some time with more reversed gecoding search functions for Hotels, Wikipedia and even Street Views (360 degree panoramas.